Ian reports that Spring had sprung at Grosmont on Saturday, with blue skies and sunshine. Bill Dobson, Trevor Wilford, Alan Hardie, Nigel Hall and Ian took advantage of the sunbathing weather, although the day really started on Friday afternoon with Bill and Ian loading our last consignment of small scrap tubes onto the NYMR transit. That was successfully done ready for delivery to the scrapyard on Saturday morning, as it closed at 11.30 am. Ian left Grosmont about 9.00am on Saturday and delivered the scrap to European Metal Recycling at Marske by the Sea, with the load weighing in at 0.740 tonnes, bringing in £122.10 and a total of £315.90 for the Q6 fund with the previous load. At Grosmont there were still no mice to report, and Ian assumed the usual cuppas were consumed as he missed out yet again. Alan Hardie spent all day cleaning scale off the flue tube for our new stove chimney. Trevor was making brackets for the flue tube/chimney so it can be erected and fastened to the wall at the outside end of the workshop just above No 8 road. Should be ready just in time for the summer! Bill fitted 4 washout doors and 7 boiler plugs in the cab area. Nigel got a second coat of gloss paint on the J27 lockers and also some paint onto the underside of plates in the rear cavity of the tender which had been omitted at Hopetown. Another coat was also put onto the underside of the sump. The rear RHS vac pipe bracket was found to be only finger tight and he managed to tighten this up, albeit with some difficulty as it’s almost impossible to reach the rear bolt head with a spanner. 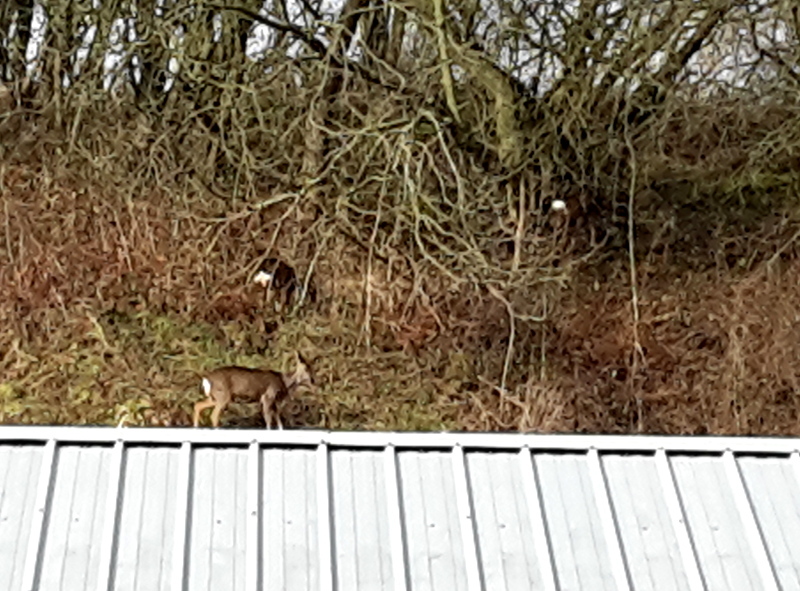 Lunch was had in Deviation Shed with quite a few visitors round watching the consumption by everyone of their snap/bait. After lunch, Ian gave the fridge a clean out as there was a build up water and sludge in the bottom. Then he was asked to show a party of people around the whole of the MPD area. They were relatives of Kieran Murray, the Carriage and Wagon Foreman, who was not available. After taking them round the MPD area, Ian then had to make a sharp exit as he was going to the Sage at Gateshead to see "The Hollies", a great 60's band - no comment! The elements have now been completed and successfully hydraulically tested by Mathew Storey. Bill is arranging to borrow the NYMR transit again top go and collect them, hopefully taking the J27 old smokebox wrapper to the scrapyard at Marske on the way to earn some more money. A grey, murky, bitterly cold day at Grosmont, with dense thick fog on the A171 and A169 roads leading to the railway. Those that made it to Grosmont were Bill Dobson, Nigel Hall ,Ian Pearson and myself, and we were joined later by two shed cleaners - Chris Wakefield and Ethan Humble. After the usual cups of tea (and again no more mice to report) we started work with Nigel painting the J27 tender lockers. The new compressor belonging to the Essex Loco Society was in action, with William Parrish and his contractor doing some riveting on the S15 boiler, but, unfortunately for Nigel, the J27 tender is opposite to the S15 boiler and it got very noisy at times - he couldn't even hear the calls for tea! Ian set up hoses ready to wash out the foundation ring. Ethan went into the boiler to remove some old copper ferrules which had got lodged between the inner and outer water space area of the foundation ring. Then he cleaned about four mud hole doors which had rusted up somewhat since last being cleaned. Ian and Chris Wakefield then set about washing out the foundation ring and removing scale which had accumulated around the mud holes. I spent some time down at the MPD assessing the progress of the J27 with Mark O'Brien (separate report to follow). I also made a brew of tea, and lunch was had in Deviation Shed . Our two cleaners then left as they had been on duty since 5am. After lunch I assisted Ian and completed the wash out, which included Ian getting soaked from a splash back. Bill went off to the stores for some door joints, but, as there are three different sizes on the Q6, Charlie Dore brought a box full up to the shed where he and Bill fitted all the doors with joints. In the meantime I cleaned most of the remaining doors - there are two left to clean. Ian fitted two wash out doors while Bill fitted six doors. We have been told the cutters are now completed so we should get the last of the flue chamfers cut shortly. The required copper ferrule is also reported as being ordered. Once delivered then we can start putting tubes into the boiler! The elements are also being worked on by Mathew Storey and should be ready for collection in the next week or two. The big end bearing has still not been machined because of priority having to be given to work on bearings for 80136, but it has been promised yet again for next Wednesday. A grey, but dry, start to the morning again at Grosmont with bursts of sunshine and then a tropical downpour in the late afternoon. Bill Dobson, Steve Hyman (until early afternoon), Jon Bradley, Nigel Hall, Bryan Orange, Luke Perry of the JVs, Ian Pearson and myself were present, plus JV Tom Noble appearing occasionally during breaks in his cleaner duties at the MPD. No mice to report again, cups of tea all round, bar Ian who was late arriving - serves him right for sleeping in! First job was to get into the NYMR's Transit pickup, which required some muscle power, before taking it round the East side of Deviation Shed to load up the old scrap boiler tubes. So it was all hands on loading the scrap tube, with Bryan cutting some in half after Jon had borrowed a large angle grinder with a cutting disc from the MPD and set up an extension from our Shed . By the time we got the pickup loaded and tied down it was lunch time, so it was lunch in Deviation shed on the bench. There is another load to be taken to clear the Q6 scrap tubes, and we need also to take the ex-Crewe now scrap smokebox wrapper: the pickup has been booked again for next Wednesday. This work site also provided the opportunity to admire the new guttering on the East side of the Shed which the contractor had installed earlier in the week - the West side should be done next week. After lunch, Ian and Jon set off with the scrap to Marske by the Sea, to European Metal Recycling Ltd. Their load weighed in at just over 1.14 tonnes, bringing in £193.80 for the Q6 fund. While Ian and Jon were slaving away at Marske unloading the scrap, Steve and I fitted the brake linkage between the locomotive and tender and Bill and I put up the rear part of the locomotive brake linkage. Nigel set about repairing the left hand valve spindle follower to stop the inner section turning and blocking the oil supply to the valve spindle. The repair is nearly complete but time ran out so Nigel has kindly taken it home to his workshop to finish the job off. Bill and Ian also found a job for Gordon Wells to do in his workshop at home, namely to repair the vacuum gauge brass surround which broke while being cleaned: it additionally needs 3 very small screws to secure the surround. Ian has delivered the gauge to Gordon. Quite a bit of late running on the railway again yesterday with a land slip near Darnholm causing concern. Although it is not fouling the track, it is not far off and is being constantly monitored and trains are running by at caution. There were also reported problems on the Esk Valley line which caused delays on trains running to and from Whitby. 80136, the B1 (due to move to York on Friday for its main line rail tour trips to Whitby) and 826 Repton were in charge of trains. 76079 was on the wheeldrop during the day receiving attention to its rear set of drivers, but was moved down to the running shed at the end of the day. So not the best start to the season for the NYMR, but trains seemed to be reasonably loaded, and we had a fair number of visitors round Deviation Shed, all of whom had the donation box firmly pointed out to them! A bright, cool morning at Grosmont with a crew of only four yesterday - clearly quality over quantity! Bill Dobson and Gordon Wells were eventually joined by Ian Pearson and myself. After our usual cuppa and discussion about local and national football, cheating at cricket, failures on the NYMR at the weekend, and generally putting the world to rights, it was time to start work. Gordon spent what was left of the morning installing a new separate switch in the cage to operate the pit pump. This is situated above the circuit breaker box and the old switch in there has been disconnected and the 'pit pump' label removed. Please use this new switch to operate the pump in future. Bill and Ian removed the left hand valve follower which was trapped by the valve rod. The follower required removing as the inner section of it was loose and needs securing with a grommet. To do this, they had to remove the front pin of the L/H back gear eccentric rod from the expansion link with the use of a strop and pull lift. The follower is now on the workshop bench for Nigel Hall to repair next Wednesday, after he made such a good job of the right hand one. The eccentric rod was reassembled back into the expansion link, but with the two fixing taper pins only loosely inserted for the time being, as it may have to be taken down to refit the follower. In the meantime I sauntered off to the MPD to see how the work on the J27 was progressing. Lunch was had in Deviation Shed, with a bit of a change to the weather as there were some very heavy hail and rain showers, alternating with bright sunshine. There were quite a few visitors taking shelter and giving the opportunity for a chat about our work and some money to go in the box. One did ask though where the front pony truck for the Q6 was as he had not seen an 0-8-0 before - clearly a GWR person! After lunch, Ian and Bill coupled up the tender to the locomotive and put in the main drawbar pin plus safety link pins, with me underneath dealing with the split pinning, although Ian put the cotter and split pin into the main drawbar pin. All tender and locomotive main and safety link pins have new split pins fitted and opened up. Bill tightened up the rear nut on the drawbar sufficiently to allow the loco to be moved, but it will require further tightening later to allow the locking plate and cotter to be fitted. These items are upstairs on the shelf with label 1406 attached. I also opened out the two remaining brake hanger split pins on the inside of the frames, and tightened up the driving wheel spring hanger nuts so they were flush with the bolts, as per all the others which had been done by Alan Hardie the previous week. A bit of housekeeping was also done during the afternoon, with all the old oily rags cleared up by Ian from around the walk ways and loco frames and taken down to MPD for lighting up, while I replaced the broken bulb in one of the small inspection lamps. The L/H big end bearing was still down at the MPD being re-metalled and machined. On the railway, the boiler for S15 No 825 was brought down from New Bridge on a lowmac wagon hauled by the class 26 diesel Tom Clift. It is now standing behind Deviation Shed, but is due to be moved inside to stand above the Q6 on No 7 road. Further work is apparently still required on it, and the Essex Locomotive Society volunteers made numerous trips from Scarborough during the day, bringing their equipment and bits and pieces to the railway, including a very large new compressor which is now standing on Deviation Shed floor behind the long red bench by the cage. Trains were running reasonably full and to time, with 80136, 76079 and Repton in charge. Noticeable though that on the teak set it was the Thompson compartment coach which was much fuller than any of the open coaches. The B1 was in the running shed receiving attention to the rear driving wheel set, but was being weighed (again) by the end of the day. There will be no working party on Saturday because of other commitments, but Bill said he would pop down and open up Deviation Shed for any visitors. If therefore anyone is at a loose end on Saturday and wants to spend a few hours chatting to visitors and pointing out to them the location of the donation box, they will be most welcome. You would also be able to watch the trains go by! The next working Party will therefore be on Wednesday 4th April, when we hope the L/H big end bearing will have been returned for fitting. Ian reports a grey wet morning at Grosmont yesterday, but the sun did shine after lunch. Peter Ellis, Alan Hardie, Bill Dobson, and Ian were present for the usual cuppa, and Andy Lowes joined after his PTS course finished. Work started with Peter making and fitting cotters to the eccentrics and Ian fitting taper pins to the eccentric rods. Bill fitted the R/H trailing wheel crank pin boss after reaming it first, then fitting the side rod end caps and taper pins: only the driving wheels to do when the L/H big end brass comes back from the machine shop, promised for Wednesday. Alan was adjusting the large spring hanger nuts, so just the driving springs left to do at the moment. Peter completed fitting cotters and Ian completed fitting the taper pins. Lunch was had upstairs at the MPD where Andy Lowes and Steve Hyman joined the team after their PTS course. After lunch Andy came up to Deviation Shed and did a series of checks on the work that had been done on taper pins, cotters, split pins and various fittings. He pointed out that there were some split pins to open and nuts to tighten: these have been noted for attention on Wednesday. Peter started fitting the pressure gauges in the cab. The steam pressure and steam heat gauges were fitted but not connected to their copper pipes. The vacuum gauge was taken back to the MPD office as there were no screws holding the outer case on: it was left on Barney's desk with a note from Bill regarding the defect. The compressor was also turned on and the air line connected to the reverser to try and move the valve rod back sufficiently to remove the L/H follower, but, after several attempts, it would not move either way, even with it well oiled and the gland nuts slackened off. The hope is that we don't have to strip it down! Two flue tube have been given to us for our pot bellied stove by Kevin Yeoman of the Dame Vera Lynn Group, and are outside the east side of Deviation Shed awaiting fitting to the stove. Our thanks to Kevin for these. Quite a few visitors yesterday now the trains are running again, or at least trying to! The B1 on the first train struggled past Deviation Shed and only got past Esk Valley Cottages where it was failed with a faulty pressure gauge which was giving a false reading. It was rescued by No 926 Repton which then slipped and slid its way to Goathland with the next train, causing more late running. Things did get better later on though, with the B1 repaired and back in traffic to haul the 16.30 last train to Pickering. Working party next Wednesday as usual. Red timetable in operation. Hope to see you there. In my absence bringing a van back from Surrey yesterday, Ian reports a bright sunny but cold morning at Grosmont with Jon Bradley, Bill Dobson, Steve Hyman, Derek Shorten, Nigel Hall, and Ian himself. Later on in the morning Roy Marshall called in briefly, and feeling a bit under the weather, to deliver a couple of new strops and some paperwork for Bryan Orange (which I collected today and will give to Bryan on Saturday). No mice again, but two traps are now set! Usual cups of tea all round that cold morning to warm everyone up, then work started with Steve removing the inner part of the valve gland follower, as it had moved slightly out of line with the outer part causing the oil supply to be cut off and the valve spindle not getting lubricated. But just as he had got it apart, a call came from the MPD asking if we could spare a couple of our team to help Andrew Jeffery and Jamie Lazenby down at the MPD on No 5 road to weigh the J27 tender. So Steve and Jon spent three parts of the day at the MPD. After completing the weighing Andrew gave us a copy of the weighing results: these are in the red In box on the table upstairs in Deviation Shed (photo shows the weighing results on the electronic display and the tender being weighed). In the meantime, Bill spent some time at the MPD trying to see where we were in the queue with various jobs, from boiler work to lathe work. At the moment we still seem to be at the back of the queue, although Mark has now welded the nicks on the front tube plate. Nigel continued to repair the valve follower left by Steve. The inner and outer sections were lined up, drilled and secured with a small grommet - job complete and ready for fitting. Derek finished painting the tender steam heat and vacuum pipes then set about cleaning the grime and grease from the tender wheels. Ian continued working underneath the locomotive, fitting taper pins on the eccentric rods. Lunch was had in Deviation shed seeing as the weather was a little better, not too bad for us hardy Northern souls! Later, Jon oiled and put the trimmings into the eccentric oil reservoirs and new corks were fitted. Bill drilled through the small boss from the trailing R/H crankpin, which now requires a small taper reamer to complete the job. That will be completed on Saturday. Roy brought 2 new, 1 metre, 1 ton strops, Nos 510190 & 510186. These are now with the others in the workshop and are OK to use. Nigel found one old strop hanging from the Q6 dome - 1 metre, 1 ton, No. 880172 - which was missed at the last inspection. This looks to be in good order but cannot be used until the next inspection in six months time. It is now in the filing cabinet with the other two that were found a few weeks ago: we must try and put this equipment back in the workshop after use instead of being left out and forgotten about! All the paper records are in a red file in the workshop. Standard Class 4 No 76079 and Class 25 diesel were working top and tail on Esk Valley Line route refreshers. There was also lots of shunting round the MPD moving the J27 out so Eric Treacy could be put outside ready for its boiler lift today. The B1 and Standard Tank No 80136 were on steam tests. Next working party will be on Saturday 24th March. Plenty of milk and biscuits in stock. Remember though that Saturday sees the start of the 2018 operating season, albeit with the winter timetable used that day, Silver on Sunday and then into Red for the week before and after Easter. That means the station cafe will be open, but also that the car park will be busier than we are used to, and there may be rather more visitors about - there were certainly a lot there today when I was briefly at Grosmont checking on progress with the J27, for which a separate note will follow in due course. A pleasant, sunny at times, Spring like day at Grosmont yesterday where even the mud in the MPD yard was beginning to dry up. In attendance were Bill Dobson, Ian McCall, Steve Hyman, Derek Shorten, Nigel Hall, Jon Bradley and myself. Fortunately no mice as Bill had forgotten to bring some new mouse traps. After the morning tea, Derek got on with painting the steam heat and vacuum pipes under the tender with a coat of black gloss, and Nigel made a start on prepping the J27 tender buffer beam ready for John Furness: it is now in anti corrosion green primer. I spent the morning at the MPD checking on progress with the J27, about which a separate note will follow. Ian McCall, on his last visit for some weeks, machined down the eccentric locking nuts on the lathe in the workshop. The rest of the team put up the inside left eccentric, having decided that this would not prevent the outside one being fitted once it had been straightened. Lunch was had on the bench in the Shed. After lunch, Barney came up to Deviation Shed to check the eccentrics, and stayed to help, with advice and muscle power, the fitting of the left hand connecting rod. This involved moving the locomotive forward half a turn to get the big end down to the bottom so the rod would clear the step, and, with a bit of jiggling, and a lot of heaving, the rod went home in the crosshead. In the absence of the big end bearing, a block of wood was put in to keep the rod off the bearing axle. The bearing itself remains at the MPD awaiting machining after being remetalled. Steve then spent the rest of the afternoon securing the little big end with its nut and driving the cotter home - which also involved removing and refitting the recalcitrant oil pot to get access. In the meantime, the by now straightened, skimmed and cooled, left outside eccentric rod was returned to Deviation Shed, was satisfactorily NDT'd during the afternoon tea break (yes, we have three tea and biscuit breaks in total during the day to keep us going!) and then Jon, Bill and myself fitted it to the locomotive. All the nuts are only finger tight, and the securing pin in the plug at the valve end was not fitted. All the eccentrics will need a thorough check for nuts, pins and cotters. In the meantime, Ian was making new cotters for the eccentrics, but the pillar drill failed and a number will need the split pin holes drilling using the hand drill unless the pillar drill can be cajoled back into operation. There were only a small number of visitors, but the B1 was still in the MPD, having been stopped on Saturday from going to the Severn Valley because of problems with its springs, discovered during efforts to weigh it. There remains some doubt as to whether it will make its GB Scottish railtour participation, although every effort is being made to get it there. In any case, the Esk Valley line is closed following a bridge strike at Castleton. Initially thought to be by a bin lorry, it now appears it could have been a Yorkshire Water vehicle. Either way, the strike was such that the bridge has apparently moved 10 inches on the stone piers and the track has been deflected as a result. It is hoped repairs will be completed by tomorrow, but it meant that Tornado, which was also due to go to the Severn Valley yesterday, had to go down to New Bridge, and then be taken by road. There are also reported to be problems with the firebox of Eric Treacy which mean it may not be returning to traffic any time soon. Although there is still work that can be done on the Q6, we are now waiting for the MPD team to complete a number of jobs before we can finish the bottom end and get on with the boiler retubing. With a number of individuals also unavailable this weekend, it has therefore been decided to have a break, and there will be no working party this Saturday. The next one will therefore be on Wednesday 21 March. Hope you will be there. 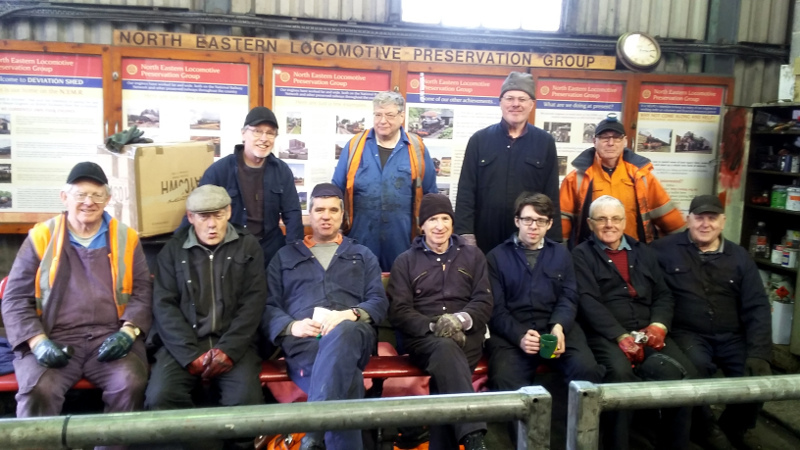 Ian (who was present following a cancelled diesel course), reports a murky, wet, morning at Grosmont with Andy and Joan Lowes, Peter Ellis, Trevor Wilford, and Bryan Orange and the JV's. No mice to report again but he thinks new traps are required as the chocolate has been consumed from our trap - can Bill bring some new traps please! There was fantastic support from some of the JV's parents, with Ethan Humble's Mum and Grandmother manning a sales stall, with cakes, tea and coffee. Another JV's Dad, Andy Pritchard, set up a small model railway layout alongside the stalls. These all attracted lots of visitors into Deviation Shed and also watching Tornado passing by on its way to Pickering, the B1 shunting around the yard and steam heating stock at the Station, and Standard Tank 80136 on passenger work. About £110 was made at the stalls - a tremendous effort and much appreciated by the Group. Some JVs were working on the J27, some with Piglet working on Lucie, and some working on the Q6. Both valve bores were cleaned with fine emery paper by one of our JVs, with Joan Lowes supervising other JVs on other work, including full greasing of the locomotive and tender. One new JV was working with Bryan, refitting plugs back on to an extension cable and light fitting which got damaged last week. Peter spent the day making new cotters for the eccentrics, and has made and fitted cotters to the left hand side eccentrics. Some of these will need the locking nut reducing slightly to make a better fit, and hopefully Ian McCall will be able to operate the lathe in our workshop to do this on Wednesday. Trevor removed an old stud which was jammed in the regulator valve and fitted two new studs. This valve has now been put back upstairs on the shelf. Andy, with one of the JV's in attendance, worked on each valve in the workshop, completing the assembly with cotter pins ready for fitting. Ian has emphasisied that if the valves have to be dismantled for any reason, the new keys which Andy fitted inside at the rear end of the valve have a small hole tapped into them. An M4 bolt can be screwed into the key for easy removal. Ian himself was working fitting taper pins into the front end of the eccentric rods: a long slow process getting pins from the shed, cutting them to size and filling and splitting. The top two are still to do on Wednesday. Lunch was had down at the MPD mess room. Afterwards, Andy, Trevor and JV Henry Pritchard fitted the valves. These are still to connect to the valve rods, but the cotters seem to be too loose when fitted and it looks as if new ones will have to be made: the old ones are on the pit wall below each valve. Two strops were found by Trevor on the engine which seem to have missed the inspection a couple of weeks ago. These are 2metre I ton strops Nos 856525 and 856527 and they have been put upstairs in the metal filling cabinet, 3rd drawer down . If so they will have to be inspected next time there is an inspection about 6 months time but in the meantime do not use these strops until their status has been clarified. Trevor will not be available for the next three Saturdays, and next Wednesday is the last that Ian McCall will be available for six weeks. The next working Party will be on Wednesday (14th March), by when, hopefully the last of the flue tube holes will have been chamfered so work on the boiler can be progressed. 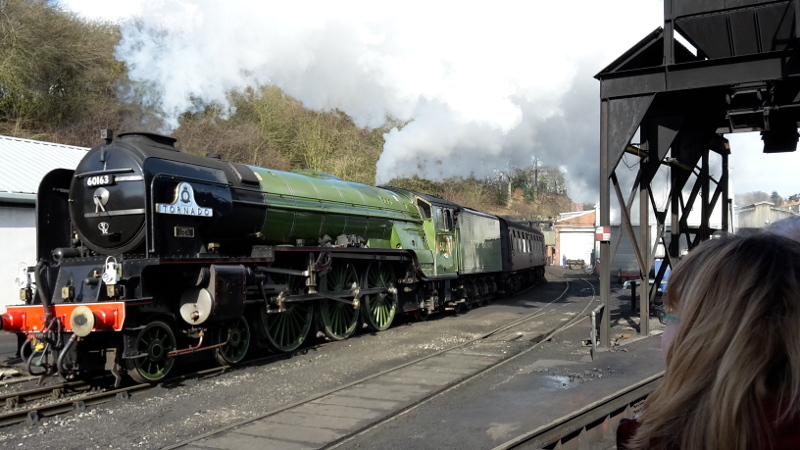 A much better day weather wise at Grosmont yesterday - a lot milder than of late and glorious sunshine in the middle of the day as Tornado passed Deviation Shed. Tornado also worked the 09.30 train to Pickering, as well as the lunchtime departure and a special train for A1 Trust covenantors and supporters at 15.40, while Repton took the 10.30 train to Pickering and 80136 was pottering up and down the line to Goathland on running in turns. What more could you wish for? (but don't answer that question!). There was a really big turn out at Deviation Shed with 10 of us, later being joined by two young cleaners from the MPD. To mark the occasion, Daniel Gibbard took the attached photo of the assembled miltitude at lunchtime, but for the record those present were Bill Dobson, Ian McCall, Derek Shorten, Steve Hyman, Nigel Hall, Roy Marshall, Jon Bradley, Dave Donegan, Ian Pearson and myself, joined by the two cleaners - Chris Wakefield and Daniel Gibbard. But no mice. Fortunately there was plenty of milk, so the kettle was on almost constantly to provide cups of tea for such a gathering before getting to work. We might need a bigger teapot if the numbers continue at this level! Derek put a coat of paint on the vacuum and steam heat pipes under the tender and cab, as well as washing up and making some of the many brews. The two Ians, with assistance from Jon, removed the damaged left hand forward eccentric rod which was taken down at the MPD for inspection and rectification. There was much scratching of heads over the best way to effect the repair but they were due to give it a go today. The Ians then fitted the right hand eccentric rods, but note, these are only fastened hand tight and the taper pins at the front of the rod are just loosely fitted. Roy spent most of the day making cotters for the eccentrics. Bill, Dave, Steve and Nigel fitted the crosshead to the piston rod on both sides of the locomotive. Lunch was taken in Deviation shed while our two young cleaners volunteered to go into the boiler to fit the regulator rod through the retaining bracket and into position through the stays. It was then successfully located through into the cab with the help of Bill and Jon, and the regulator handle was fitted to avoid anyone bumping themselves on the protuding end of the rod. After lunch, the right hand connecting rod was fitted by the crosshead team: the little end has been tightened up and cotter pin put in but not opened. The big end brasses have been assembled on the rod and are fitted onto the journal but have not been fastened up as they may need shimming. It is sat on some timber for support. There were a lot of visitors, including our Treasurer, Richard Wheeler, but he would not accept the offer of a spare pair of overalls and to get stuck in - not even a cup of tea! - but did meet some of the MPD staff with whom he has regular dealings, but had not previously met. I had to leave about three o' clock as I had been invited to travel to Pickering and back on the A1 Trust special, and on which there were a number of NELPG members. Piglet came up to Deviation Shed about 4pm, just as the team was packing up, to work on Lucie for a few hours and he agreed to lock up the shed when he had finished. Ian reports another cold grey day with the odd snow flurry at Grosmont. All the main roads were open from Teesside and Wetherby with Ian McCall, Peter Ellis, Bill Dobson, Trevor Wilford and Ian in attendance. Around lunch time came Nigel Hall, followed by the hiab down Esk Valley bank with the J27 cab, chimney, sand boxes, springs and various other bits and pieces (see separate report and photo from last night). The usual cuppa was prepared by Trevor (what a great guy) and no mice again. Work started with Trevor removing the last nut from the header, which was then removed, while Ian P, Ian M and Peter removed the left inside eccentric for drilling out the oil way hole which was too small for the syphon tube. After drilling and fitting the tube, this eccentric was fitted back onto the sheave with a 15 thou shim put in, and tightened up. Lunch was had in the warmth of the MPD mess room. After lunch, the two Ian's had a quick look round Tornado. Then back to work trying to fit the left hand eccentric rod. This became very frustrating as it would not sit flush onto the eccentric. No matter how much we tried to knock it, and move it up and down, it did not want to move. It was taken down and some filing was done, put back up and still it would not fit. As time ran out, this is something for another go on Wednesday. Ian M started to make new cotters for the eccentrics, but didn't get far as he was helping Ian P and Bill with the eccentric rod. Not much to report on the boiler: there's one or two chamfer's still to cut on the flues. Nigel delivered the Q6 valves. These are now stored behind the bench in Deviation Shed with a pink blanket over them.